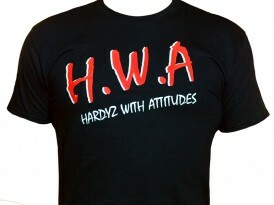 “Hardyz with Attitude” T-Shirt at ShopMattHardy.com! The Hardys vs Team 3D vs The Wolves Bully repeatedly chops Davey, then Davey comes back with a few strikes before Eddie stops Devon from hitting Wassup! off the top. Matt and Jeff hit Poetry In Motion, then Bully sends them outside and Devon assists with an elevated neckbreaker. 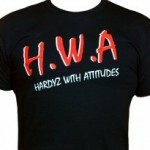 Matt tags in and hits a clothesline and a Side Effect for two, then Devon and Matt both try to clothesline Eddie, but Eddie ducks and they hit each other. Jeff catches an offguard boot on the apron, then Eddie and Davey duck clotheslines by the Hardys before splashing Team 3D on the floor. The Hardys follow with their own splashes, then Matt hits a top rope moonsault to the floor and rolls Eddie in to get a two count. Matt calls for a Twist of Fate but Davey kicks him in the face, then Eddie follows with his own kick before Davey hits a German suplex for two. Devon breaks it up before he swings at Eddie, but Eddie ducks and throws him in the air before Davey kicks him in the head. Bully breaks up a pin attempt before Jeff clotheslines him, then Jeff dropkicks him up the ramp as Davey kicks Matt in the head and heads up top. Matt avoids a double stomp and hits a Twist Of Fate, then Bully pulls him outside to avoid a pin before Jeff hits a Swanton off the top, but that gets broken up and Team 3D wins it with a Death Drop. The Hardys Hungry for Gold The Hardy Boyz come out and talk about how their goal is to be the best tag team in the world, then Team 3D comes out and says they have an answer for them. Bully says they were talking earlier tonight, and they are the guys who put Dixie Carter through a table, but they are also one of the best teams ever. He says it would be pretty cool if either team could be tag team champions, so he says they need The Wolves out there for this to go down. The Wolves meet them and Eddie says he wants to be a part of the ‘greatest team ever’ conversation, and Davey says both teams have an open title shot anytime they want.